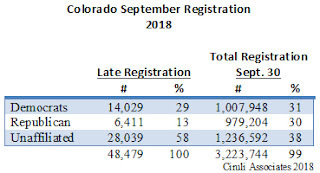 Corey Hutchins of the Colorado Independent reports that September’s voter registration figures benefit the Democrats more than two-to-one over Republicans, but unaffiliated voters beat them both combined (58% of total). As of September 30, unaffiliated voter are 229,000 registrants ahead of second-place Democrats with Republicans in third, about 28,000 voters further back. The Trump era and Colorado’s recent growth has not been kind to Republicans. 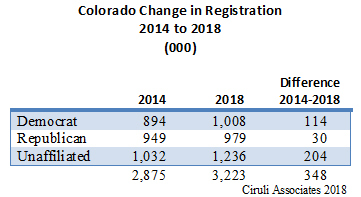 At the end of September 2014 when John Hickenlooper ran for reelection, Republicans were ahead of Democrats by 55,000 voters. That edge helped Cory Gardner beat Mark Udall by 39,000 votes. In the last four years, unaffiliated have added 209,000 new registrants to their rolls, or 59 percent of the total 348,000 new voters. Democrats beat Republicans in new registrants by more than three-to-one over the last four years to gain their current 28,000-vote advantage.